In our first webinar with Professor Jeanne Liedtka (January, 2018) she reported on her in-depth research of over 30 organizations who used design thinking in practice - so that we could understand how to legitimately evaluate design thinking's overall impact. Updated model: The design thinking elements and their enabling mechanisms work together to effect innovation processes and actual outcomes. 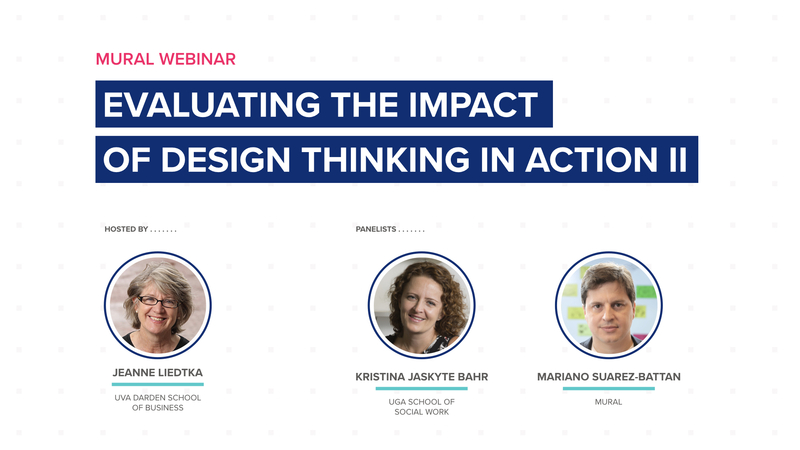 In our follow-up webinar (April, 2019), Jeanne came back to share updates on her previous research study as well as introduce a new tool she developed with colleague Kristina Jaskyte Bahr (University of Georgia School of Social Work) which allows you to self-assess the impact of design thinking within your own organization and see how your results compare to those of other companies. If you missed the webinar, we've got all of the resources below - including the presentation deck (with links to the new materials), the full video recording, and special access to the evaluation tool. McKinsey's Business Value of Design and Forrester's TEI of IBM's Design Thinking Practice put quantitative research around what the impacts of design thinking are. Follow along as Jeanne sheds light on how we can deconstruct the elements of design thinking in order to materially understand its impact. Stick around for the Q&A where our hosts field the most up-voted questions from the attendees. After unpacking and studying all of the elements of design thinking, Jeanne and Kristina re-packed them into a diagnostic tool that they believe will begin to provide a simple, straightforward tool for helping people assess how design thinking is adding value in their organization. Use this tool to self-assess the impact of design thinking within your own organization and see how your results compare to those of other companies. 🎁 📈 Share all the design thinking goodness you just soaked up!